I have been a member of a union for over thirty years and have had leadership roles for half of that time, but recently attended my first CTU conference. The impression many have of unions is shaped by those who oppose them and that manipulated image would have been challenged for anyone who had the opportunity to be there. The conference wasn't full of card carrying communists in cloth caps, around fifty percent were women and some of the largest attending affiliates consisted of professional people. Only 20% of workers are now represented by a union and those not represented are most likely to be on the lowest wages and in casual work. It is now 100 years since the Great Strike when Massey's Cossacks were used against the striking watersiders. Unions had not had a long history in New Zealand at that time, with the New Zealand Federation of Labour only being formed four years before. It is important to remember the appalling conditions that many workers were subjected to at that time and how much workers have gained because of unions. Tea and lunch breaks, health and safety laws, reasonable hours (the forty hour week) and adjustments to keep up with the cost of living were all achieved because of collective bargaining and unified action. Sadly we are now losing much that had been gained when unions were strong enough to balance the power of employers. By blocking worker representation in employment matters we are seeing a return to the bad old days of profit before people. The Pike River disaster and the shocking number of deaths and injuries in the forestry sector would probably not have occurred if we had a stronger union presence. Proposed changes to employment law will see the balance tipped even more in the employer's favour. Tea and lunch breaks will become optional and collective bargaining is now something that employers can avoid. We have around a quarter of our workforce earning wages that they cannot live on without extra support and the increased casualisation of employment means many have no certainty of income or hours of work. That 270,000 children now live in relative poverty while the wealthiest New Zealanders have never had it better and CEO salaries and director fees are skyrocketing demonstrates a need for bringing more balance to wage bargaining. New Zealand is currently experiencing the fastest growing income inequality in the OECD. The CTU's major campaigns are around the living wage, casualisation, vulnerable workers, health and safety and gender inequity. It was notable that the presidents of the New Zealand and Australian councils of trade unions and the International Confederation are all women. Women are more likely to suffer poor working conditions and pay than men and the gap between the incomes of men and women in New Zealand is growing. Jobs that are female dominated tend to be given a lower value and our aged care workers, teacher aids and cleaners often find themselves earning around the minimum wage no matter how many years that they are in the job. The Green Party's campaign to support a living wage is using the plight of the parliamentary cleaners to highlight the lack of recognition given to important low waged work. Many of these cleaners are the main income earners for their families and have been doing the same job for many years but still earn similar pay to a school leaver. 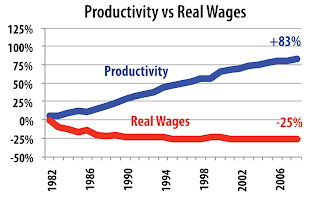 Unionists aren't marxist radicals who are plotting revolution and attempting to destroy the economy, we are hard working New Zealanders wanting fair wages and working conditions and a fair share of the productivity increases that we have provided to our employers but have consistently been denied. The speeches from Green Party and Labour leaders expressed strong support for New Zealand workers and the unions that represent them. We now have a clear choice, we can continue on the current path of growing inequality or vote for a government in 2014 that will reintroduce the concept of fairness to our employment culture.